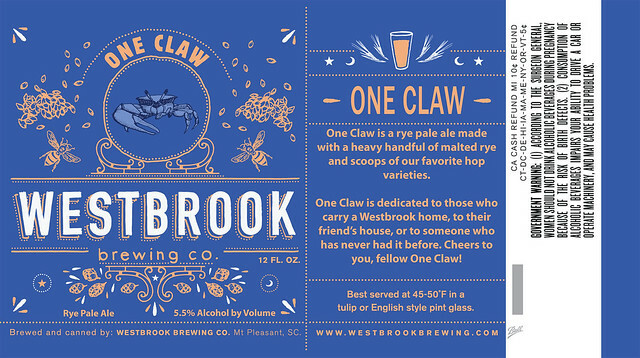 Westbrook dubs canned rye pale ale One Claw | Drink. Blog. Repeat. The third canned beer from Westbrook Brewing Co. finally has a name and a design to go along with it. One Claw, a variation of the Mt. Pleasant brewery’s Citra Rye Pale Ale, will soon be hitting shelves next to IPA and White Thai. The beer has been available on draft as “New Rye Pale Ale” while the brewery worked on a name and label design, which you can see below. Earlier this year, Westbrook announced it would be adding the third, year-round canned offering to its growing slate of beers. You can also expect to see Gose released in cans soon as well.